Do Not Worry For He Cares For You! Do Not Worry For Your Abba Father Knows The Number Of Hairs On Your Head! Do not worry. Do you know God knows the exact number of hairs on your head? (Matthew 10:30-31) The LORD knows when you will grow new hairs or drop your hairs. At different points in our lives, the LORD God provided supernaturally for my family at the right time. Whenever I have doubts about God's provision, Matthew 6:25-34 is of great comfort to me and my family. And whenever I claimed God's words of provision for myself and my family, I received the answers to my prayers and faith declarations. God never fails. His Words never fail. When He says He shall provide for you, He will surely do it. All you need to do is to ask, believe and receive by faith. Here is one true story about George Mueller. He is a man of faith. When he was alive, he opened an orphanage for the homeless children. There was once when it was meal time but the orphanage does not have any food at that time for the orphans. George Mueller came to know of this early and he prayed for the supply of food. He trusted the LORD that He is the One who supply all their needs! (Phil 4:19) Miraculously, the food supply came just in time! It is an amazing story. Your God is the same yesterday, today and forever! (Heb 13:8) Your Abba rained down manna for forty years (Exodus 16:35) in the wilderness. How much more will He take care of you today! Just like the newborn babe, as long as he latched on to be breast-fed, the supply is there. The more milk the babe took in, his mummy's body will produce even more milk to meet this need. Are You Constantly In Worry? "Therefore I say to you, do not worry about your life, what you will eat or what you will drink; nor about your body, what you will put on. Is not life more than food and the body more than clothing? 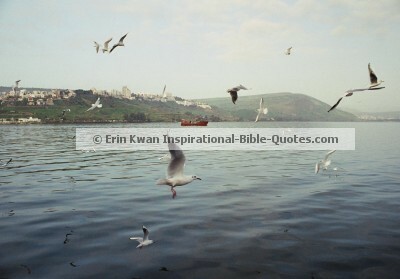 "Look at the birds of the air, for they neither sow nor reap nor gather into barns; yet your heavenly Father feeds them. Are you not of more value than they? I would have lost heart, unless I had believed That I would see the goodness of the LORD In the land of the living.